On September 12-13, 2015, Team Affiliate Marketers Give Back took on another Avon 39 challenge, this time in Santa Barbara, CA. The Avon 39 is The Walk to End Breast Cancer – 2 Days, 39.3 Miles, 7 Cities Across the United States. The money raised during the event helps fund research, awareness and education while providing assistance for families currently battling breast cancer. It also supplies much-needed screenings and treatment to detect breast cancer and stop it in its tracks. This was my ninth breast cancer walk and as captain, I was privileged to walk with these incredible 39’ers: Robert Duva, FinandField.com; Liz Fogg, MyBlingPlace.com; Joel Garcia, Lab6Media.com; Adam Riemer, Adam Riemer Marketing; Kevin Strawbrige, Rackspace and Melissa Salas, WorldOfWatches.com. Nearly 2,300 other walkers conquered the 39.3 miles to crush breast cancer with us. In total, $5.3 Million was raised in conjunction with this walk with our team coming in fifth place, raising nearly $48,000. I was excited to see that I was the Top Fundraiser this walk, coming in at $34,513.81 and that Team AMGB came in at #5! I walked 39.3 miles (my RunKeeper app said it was even more) with the Affiliate Marketers Give Back team in the Avon Walk for Breast Cancer in New York City this past weekend. I ended up at the #6 overall individual fundraiser with $17,157.92, and our Affiliate Marketers Give Back team raised and donated $40,406.61, which will fund research to find a cure or prevention, as well as programs that enable all patients to access quality care. A key priority is the medically underserved, including low-income, elderly, and minority individuals. The first day was Saturday, October 18, and we got together before sunrise on the west side of Manhattan. The early start kicked off a marathon walk that was supposed to be 26.2 miles, but the route was mis-marked, so we ended up walking some bonus miles. It was a really neat way to see New York. We finished the first day of walking on Randall’s Island, and I was really happy to make it the whole way without any blisters, but I did manage to mess something up in my right knee. The second day, Sunday, October 20, started before sunrise with a breakfast in the dark morning. We loaded up on some carbs and protein before setting out for the remaining 13.1 miles. I hit the medical tent to get my knee wrapped and to gobble some painkillers before we set off. That was a little tough to leg out the final day, but I did manage to escape without a single blister – my strategy of Injinji toe socks, as well as Body Glide and Blister Shield, kept my feet in good shape the whole time. Unfortunately, the blister goblin was not as kind to Tricia Meyer. I figured our miles would be longer the first day, because the route was not labeled correctly, but RunKeeper tallied more than 13.1 miles for us on the second day, too. Whatever the total was, it felt like a lot of miles. In the late morning of the second day, we hit the finish line, and that was such a satisfying and emotional moment. All of the training and fundraising and everything lead up to that happy moment at the end. We didn’t get to enjoy it too long, though. We had to race back to the hotel and clean up for a flight to Charlotte, NC to go to ShareASale ThinkTank. Before we left the finish line, I stepped back over to get a shot of my hat at the finish line. It was a hat my mother-in-law, Maria Sanchez, gave me a few years before breast cancer stole her away. I wore it for the whole walk to keep her with me as I walked in her memory. In the end, the Avon Walk for Breast Cancer in NYC raised $7 million dollars, and I was proud to play a role in that. Thank you so much to everybody who supported me through donations, positive thoughts, texts, etc. Also, I’d like to give a big thank you to the Affiliate Marketers Give Back team. It was a lot of fun to spend all that time getting to know the folks on the team better. And a big thanks to Avon and all of the volunteers who made this all happen. What a giant undertaking, and it ran so well, and they took such great care of us. What an inspiring, humbling, wonderful, emotional, and transformative weekend. All money raised by the Avon Walk for Breast Cancer is managed by the Avon Foundation for Women, a 501(C)(3) public charity that funds a comprehensive network of programs and services dedicated to serving breast cancer patients and their families through five areas of the breast cancer cause: awareness and education, screening and diagnosis, access to treatment, support services, and scientific research. 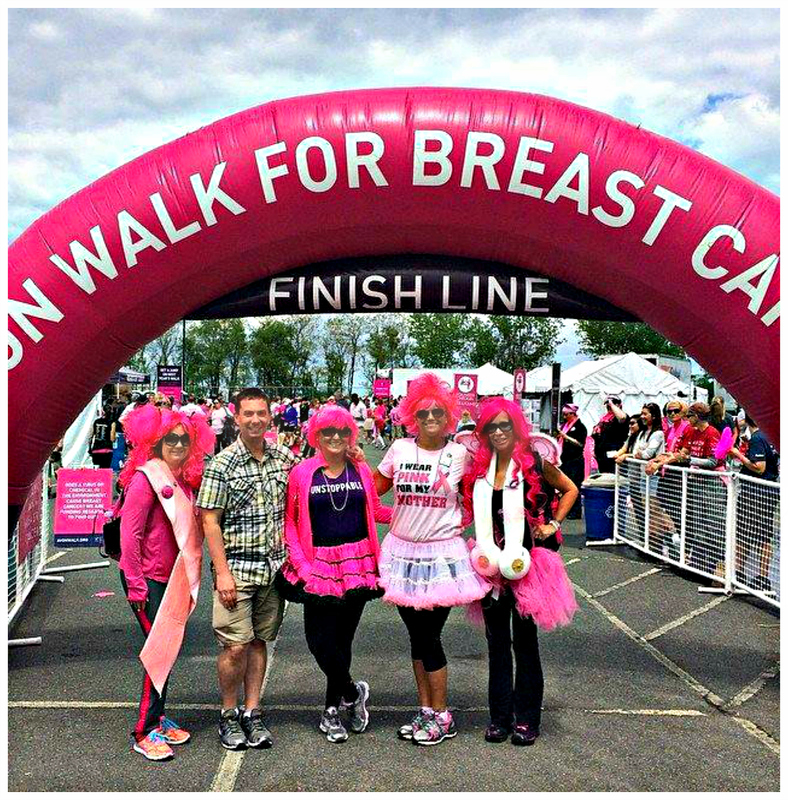 At approximately 1:30pm ET on Sunday, May 18th, Team Affiliate Marketers Give Back crossed the 39.3 mile finish line of the 2014 Boston Avon Walk for Breast Cancer. Our team raised $48,650.20 and a total of $3.9 million was raised for this walk to accelerate breast cancer research; improve access to screening, diagnosis and treatment; and educate people about breast cancer. The Avon Walk Boston, the third of eight 2014 Avon Walks across the country attracted more than 1,700 participants from 35 states and Washington DC, as well as two countries, and drew 287 men and 287 breast cancer survivors to raise life-saving funds and awareness for breast cancer. We were also thrilled to find out that Team Affiliate Marketers Give Back was the 5th largest fundraising team during this walk and I was the top individual fundraiser. We had an amazing, yet grueling time because of the rain. A few more team blisters popped up than on previous walks. We also had a fun time at our Cheering Station which was at Mile 39 on the second day. We were joined by the Boston Cannons Lacrosse Dance Team and I’d say that we definitely put a smile on the faces of the walkers as they forged on through the .3 miles. It was an incredibly uplifting experience. Massachusetts General Hospital received a $500,000 grant to support the Avon Comprehensive Breast Cancer Care and Research Center, which is the hub of all research, education and clinical care activities for breast health at the hospital. Boston University received a $300,000 grant to study if environmental chemicals cause changes to breast tumors, enabling them to spread from their original site to distant organs. Boston Medical Center received a $150,000 grant to help screen more than 17,000 women this year and provide navigation services to patients to remove barriers and coordinate access to care for prompt diagnosis. Silent Spring Institute received a $150,000 grant to continue research into the role of environmental chemicals in causing breast cancer. Dana-Farber Cancer Institute received a $150,000 grant to help researchers employ a “big data” scientific approach to determine if viruses or bacteria play a role in breast cancer development. Community Servings, an organization that served lunch and snacks throughout the Avon Walk weekend, received a $100,000 grant to help provide meals for more than 540 clients fighting breast cancer and their families, ensuring that patients receive high-quality, nutritious meals when they need it the most. Cambridge Health Alliance received a $100,000 grant to provide navigation and support services for 3,500 underserved patients undergoing diagnostic testing or treatment for breast cancer. Tufts Medical Center received a $100,000 grant to help navigate nearly 60 newly diagnosed breast cancer patients from Boston’s Chinatown neighborhood through treatment. 2014 Racial Disparity in Breast Cancer Mortality Study: The Avon Foundation funded a nationwide study in partnership with Chicago’s Sinai Urban Health Institute to determine why more black women are dying of breast cancer than white women in 39 of the largest U.S. cities. The study revealed that Washington, D.C. had a large and widening racial disparity in breast cancer mortality. Metastatic Breast Cancer Alliance: The Avon Foundation is leading a new metastatic breast cancer alliance of 20 breast cancer agencies that are working to discover better ways to help those living with the disease and reduce deaths due to breast cancer recurrences. Breast Cancer Start-Up Challenge: The Avon Foundation, The Center for Advancing Innovation, and the National Cancer Institute partnered to create a business start-up challenge to fast-track ten promising breast cancer research discoveries. The inventions were conceived and developed by Avon Foundation grantees and scientists at the National Cancer Institute. Avon Comprehensive Breast Centers and Breast Health Outreach Programs: Through Avon Walk donations, the Avon Foundation continues to fund seven Avon Comprehensive Breast Centers across the country, accelerate breast cancer screening and treatment at 55 Safety Net Hospital Programs, provide financial assistance and counseling support nationwide through AVONCares at Cancer Care, and educate the public through 58 Avon Breast Health Outreach Programs. All Avon Safety Net and Breast Cancer Outreach Program grantees commit to providing their services to everyone – no matter their insurance status, demographic background or ability to pay. It definitely makes us walkers feel great to see the impact we make as soon as we finish that last mile! If you are interested in walking, Shawn Collins is heading up the next Affiliate Marketers Give Back walk taking place in New York on October 18th and 19th, 2014. He’d love to have you on his team! 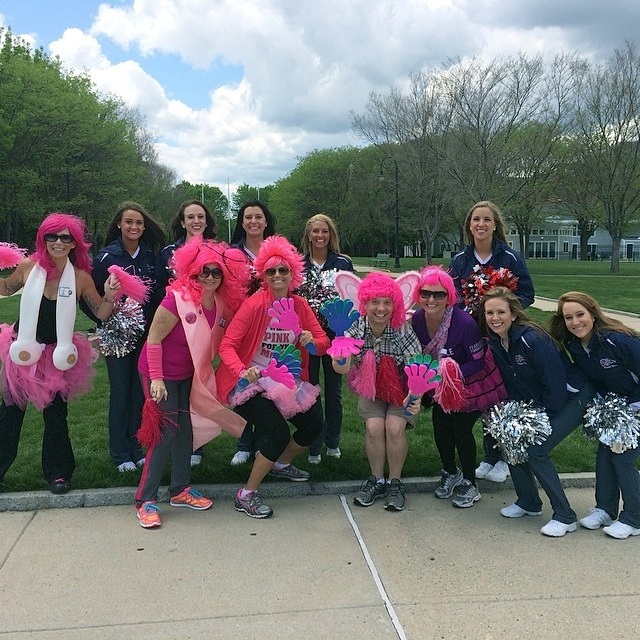 Check out all of our photos of the Affiliate Marketers Give Back 2014 Avon Walk for Breast Cancer Boston here. Danielle Raybuck and Lauren DeMarco who will be participating in the Affiliate Marketers Give Back 2014 Boston Avon Walk for Breast Cancer held a fundraising event on April 25th at Chill Wine Lounge in Fort Lauderdale. For donations starting at $15.00 you received your choice of champagne, wine or beer. In addition, they held a 50/50 raffle and a silent auction. The pair raised $1,200 that evening and also exceeded their required minimum fundraising goals, enabling them to participate in the Boston Avon Walk for Breast Cancer. Congratulations Danielle and Lauren on a job well done. If you’d like to help them out with additional donations, please click on their donation links below.